What to Ask Before Deadbolt Lock Replacement? Deadbolts are an affordable solution to safeguard your home from burglars or forced entry. Security experts believe that installing a high-quality deadbolt lock on both the front and back doors of your house is the key to making your home secure. There could be situations when you need to replace your lock. So, what are the most important aspects you need to know before deadbolt lock replacement? Faulty or Broken Deadbolt – Try to determine why the deadbolt was damaged or is malfunctioning. If the lock is broken, then maybe it was because it was old and worn out, not suitable for your door, or made of low quality materials. In this case, you will need to get a new deadbolt, the right type of deadbolt for your door, or one made of durable materials. Boosting Security – If improved security is what you want, then you will have to look for a deadbolt that is stronger and better than your current one. Also, you will need to gauge the strength of the door that it will go on to ensure it can support the deadbolt lock replacement. Replacing one on a door made with fragile material will give you no security edge you are looking for. Décor and Style – You might need to replace a deadbolt for aesthetic purposes. This can happen when you remodel the room or your home and the existing deadbolt looks completely out of place. Just ensure that in your attempt to improve the beauty of the space, you do not end up compromising on security. Consult a professional locksmith in Racine who can guide you on the type of deadbolt lock that will meet both the aesthetics and security requirements. What Type of Door Will the Lock Go On? The material that your door is made of will be an important element when choosing a new deadbolt. 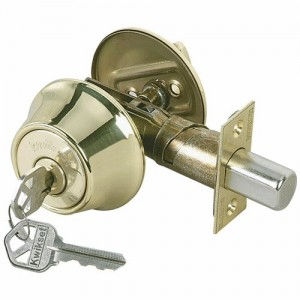 Doors with glass panels or ones situated near a window will ideally require a double cylinder deadbolt. However, a double cylinder deadbolt could be a safety hazard if you can’t find a key in time in case you need to get out of the building in case of an emergency. Since such locks are operated with a key from both inside and outside, you need to be careful where you keep your key. Doors with a hollow core may not be able to support a deadbolt at all. However, a door with a solid core is considered extremely strong and can hold well when holes are drilled through to affix the lock. Is It Necessary to Call in a Professional Locksmith? Professional locksmiths are qualified, trained, and experienced in handling all types of locks. Besides possessing the required tools and techniques of the trade, a good locksmith will also be able to assist with any other issues that might be involved. For instance, instead of turning stores upside down in your search for the right deadbolt, you could just ask your locksmith to bring you the right one based on your requirements. Whether it is a simple lock, a deadbolt lock or any other security system, it is as good as its installation. A professional locksmith like Racine’s Lock & Key will help you assess whether your deadbolt is installed efficiently. Our residential locksmith professional will assess the lock system and check if the strike place needs reinforcement. Strike plate works better if it is bound to the frame with at least 3-inch screws. In addition, it is important that the deadbolt lock is extending fully up to one inch into the hollow of the plate. Door jambs are another integral part of the entire deadbolt lock installation project and should not be overlooked. It is important to strengthen it by placing a metal strip to strengthen the jamb further. These are some of the considerations for deadbolt lock replacement and even when installing a new one. Your trusted locksmith company in Racine can help you take care of all the aspects and advise you the right course of action in terms of deadbolt lock choice, condition of the door or status of the strike plate. Once you are clear about the type of deadbolt you want, do not postpone the installation. Securing your property, your safety, and that of your family is of utmost importance and is not something that is open to negotiation. Call Racine’s Lock & Key at (262) 509-0366 for all high quality and affordable residential locksmith services.